There seems to be no getting away from Richard III right now. Anyone familiar with Shakespeare’s play Richard III will remember him as one of the great villains. A scheming hunchback who is willing to do anything and kill anyone to get on the throne. Even going so far as to kill his young nephews, Richard and Edward, the Princes in the Tower. In Shakespeare’s version of history it is eventually the heroic Henry Tudor who puts an end to Richard and assumes the throne as Henry VII. Of course there are plenty of historians who have had their doubts about this version of Richard. Shakespeare certainly wasn’t above embellishing the truth if it made for good drama and he was also writing at a time when Elizabeth 1 was on the throne. It’s not like she would have taken kindly to anyone casting doubts on the heroic legacy of her grandfather. Any sources Shakespeare had access to also would probably have been overwhelmingly in favour of Henry VII and very happy to portray Richard as the villain. Richard may not have been the homicidal villain he was made out to be. 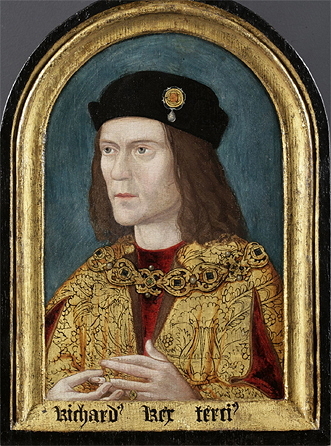 What can be known for certain about Richard is that he was the last of the Plantagenet dynasty. When his brother Edward IV died in April 1483, Richard was named Lord Protector until his nephew Edward could be crowned king. However when it was publicly declared that young Edward and his brother Richard were illegitimate because of doubts regarding the legality of their parents marriage, their uncle Richard was declared king. Not long afterwards the two boys stopped appearing in public. Whether Richard was really responsible for their death will probably never be known. Illegitimate or not, they could have become the focus of any rebellions against his rule. This was a turbulent period in English history, known as the War of the Roses. The two rival branches of the Plantagenet dynasty had been fighting on and off since 1455 for control of the English throne. There was still a lot of unrest and even if Richard felt he was the rightful king there would always be those who believed otherwise. It was in August 1485 that a rebellion led by Henry Tudor (later Henry VII) defeated Richard III. Richard died at the Battle of Bosworth field, the last English king to die in battle. Richard’s naked body was thrown over the back of a horse and displayed throughout the streets, before being buried at Greyfriars Church, Leicester. Henry had to make sure Richard wouldn’t become a martyr and his burial place a shrine. A few weeks ago, a group of archaeologists from University of Leicester Archaeological Services, and with the support of Leicester City Council and the Richard III society, set out to find the burial site. The Greyfriars church was demolished during the dissolution of the monasteries by Henry VII and in modern times had become a car park. After the archaeologists located the remains of the church they then set out to discover the remains of Richard III. They found the complete skeleton of a male showing severe scoliosis (curvature of the spine), a major head wound, and an arrowhead lodged in his spine. The scoliosis wasn’t pronounced enough to make Richard a hunchback but would have meant one shoulder was higher than the other. A DNA sample was taken from the remains and will be compared with descendants of Richard’s family, now living in Canada. Of course if the remains do belong to Richard, then it raises a number of questions. What should be done with the remains? Should they stay in Leicester? Should they go to London? Or should they be placed in York Minster where Richard had originally asked to be buried? Should it be a state funeral? And what sort of religious dedication should take place? That last one could be tricky. Since the time of Henry VIII the monarchs of England have been the head of the Church of England. But Richard III predates that and comes from a time when the English kings were still in communion with Rome. But even Catholic services have changed since the 1400s. It does raise some interesting questions though about how you deal with a situation such as this. There certainly don’t seem to be many precedents of a the burial place of a long lost king being discovered. It makes me wonder how we in Ireland would deal with this? Our kings and high kings were certainly of a different nature but what if we uncovered the long lost grave of one of them? Would we offer a state funeral or would we care? Does anyone know how other cultures have dealt with these sorts of occurrences? Yesterday (July 14th) was the first annual Cork Huguenot Day and coincidentally was also Bastille Day. 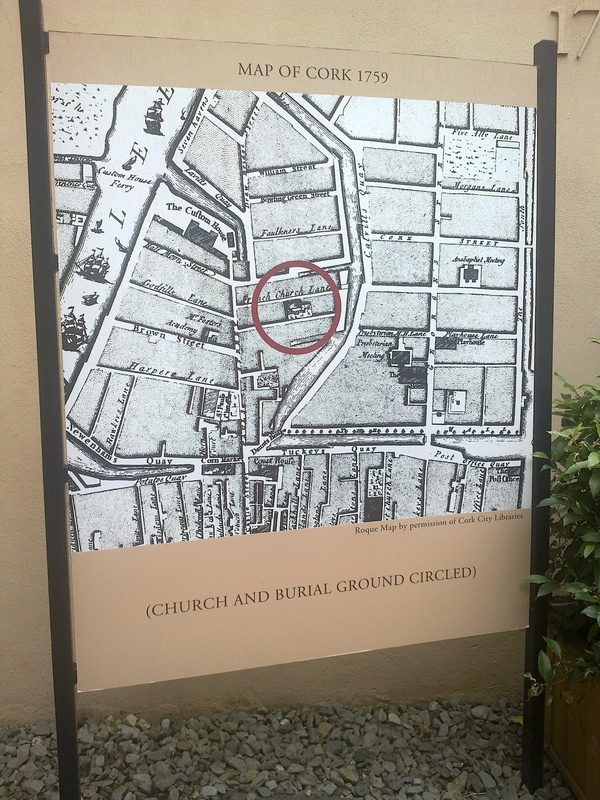 The day involved two talks in the Masonic Hall by Dr David Butler and Dr Alicia St Ledger, a break for lunch, then a brief visit to Christchurch and then the Huguenot Burial Ground on Carey’s Lane. 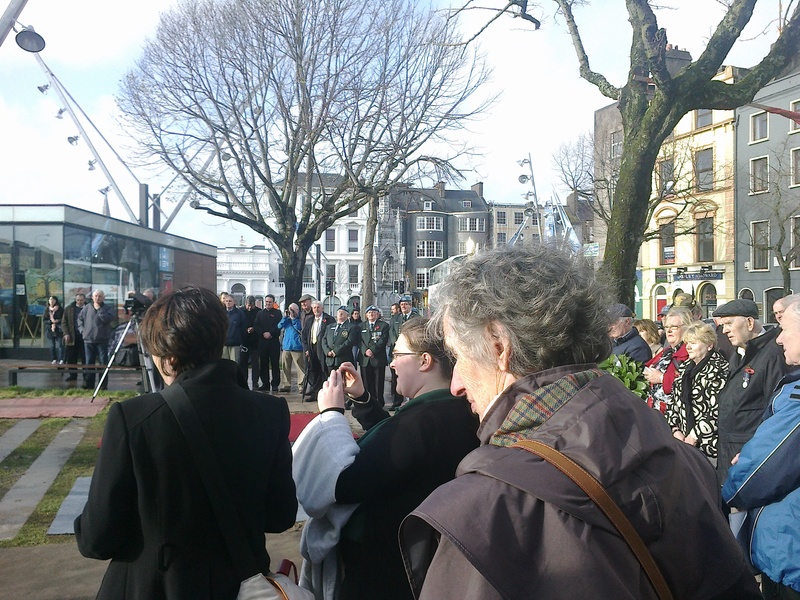 But who were the Huguenots and why should they be commemorated with a special day? The Huguenots were French Protestants, predominantly members of the Reformed Church of France. Unfortunately for them the rest of France was mainly Catholic. Under Henry IV of France some attempts at religious toleration had been made with the passing of the Edict of Nantes in 1598. This didn’t last however. The grandson of Henry IV, Louis XIV was not a big believer in tolerance. Instead he felt that the faith of his subjects should reflect the faith of their king with no exceptions. Louis saw the persistence of Protestantism as a disgraceful reminder of royal powerlessness and he wasn’t the type of person to take kindly to such reminders. October 1685, Louis issued the Edict of Fontainebleau, which removed any privileges granted to non-Catholics. Faced with increasing persecution, many French Protestants fled France. At this time religious belief was still an extremely contensious issue in Europe and most of Southern Europe was still Catholic. This meant that Huguenots sought refuge in countries such as the Dutch Republic, Denmark, Switzerland, some of the German states, Britain and of course Ireland. This was at a time when Ireland was firmly under British rule and Protestants were being encouraged to settle here. Along with providing a loyal population, it also had economic benefits as many Huguenots had skills and trades which brought prosperity to the areas they settled. Many also served in the army of William of Orange during his war with James II for the English throne. This article provides some good information on how they benefitted Ireland. Approximately 5000 came to Ireland, and of those, 300 settled in Cork, making a significant contribution to the commercial and civic life of the city, with no less than 11 members of the Huguenot community serving as Mayors of Cork City between 1694 and 1840. When the Huguenots arrived in Ireland, they were still French speaking. 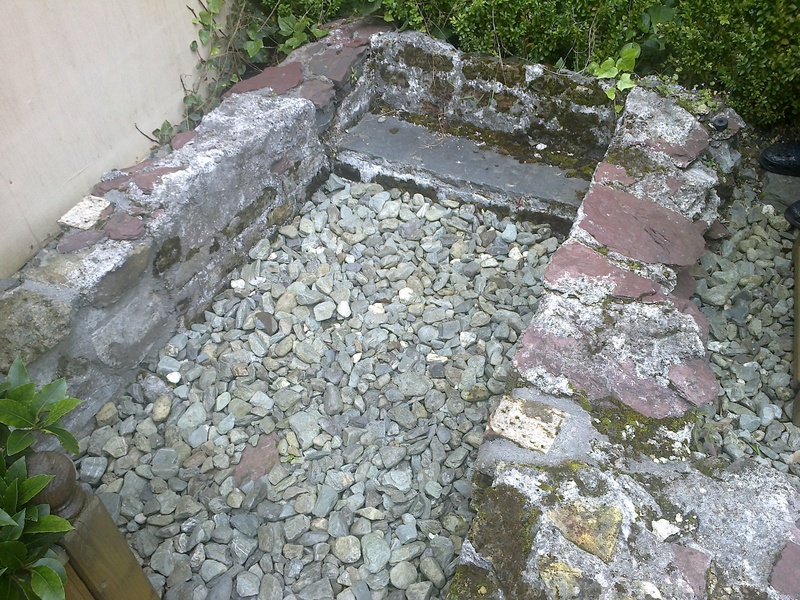 Although they fit comfortably into the Established Anglican Church in Ireland, many also founded their own churches along with their own burial grounds. In Cork this church was located on Carey’s Lane. Within a few generations most of these Huguenots families were no longer French speaking and felt no need to keep seperate churches. They also quickly became part of the political establishment. The impact of these familes can still be seen. In street names (Lavitt Quay for instance) and in some of the crafts they left behind. Many were silversmiths, jewellers, weavers and distillers. 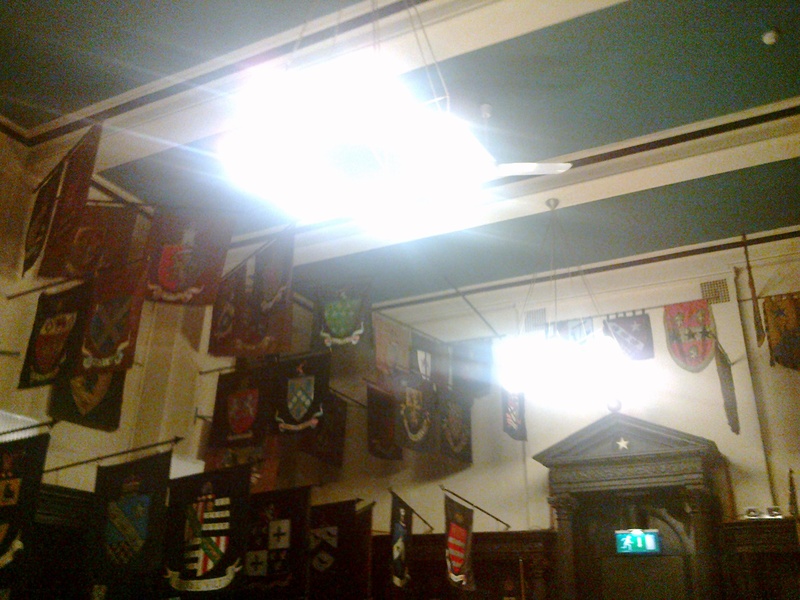 In the Masonic Hall on Tuckey Street they still have a sceptre and a few other items which were given by an Anthony Perrier. Christchurch on South Main Street has three stained glass windows in the apse which were dedicated by the Perrier family. There is also silverware in St Finbarre’s Cathedral and in the Cork Public Museum which was crafted by Huguenot families. 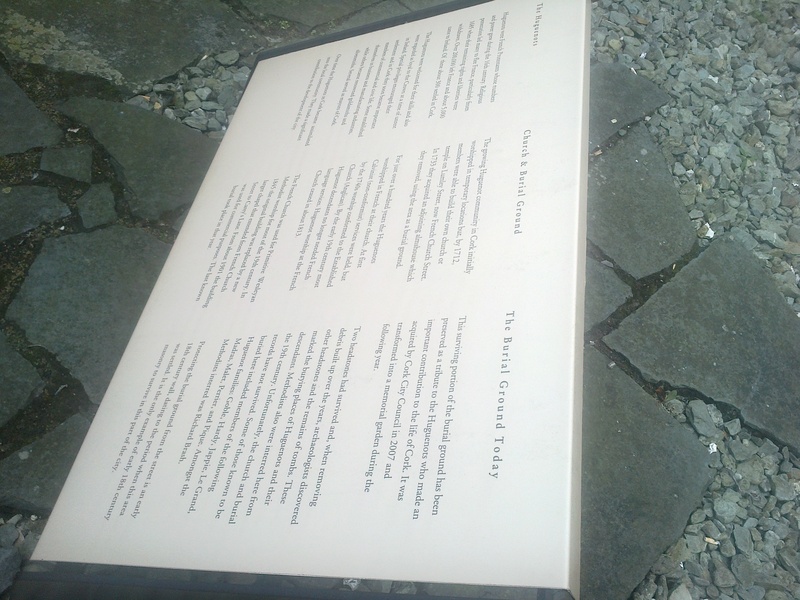 Despite these contributions it was a long time before the Huguenot Burial Ground was restored. Prior to that there had been several attempts by developers to build on the area, despite it’s cultural and historic significance. 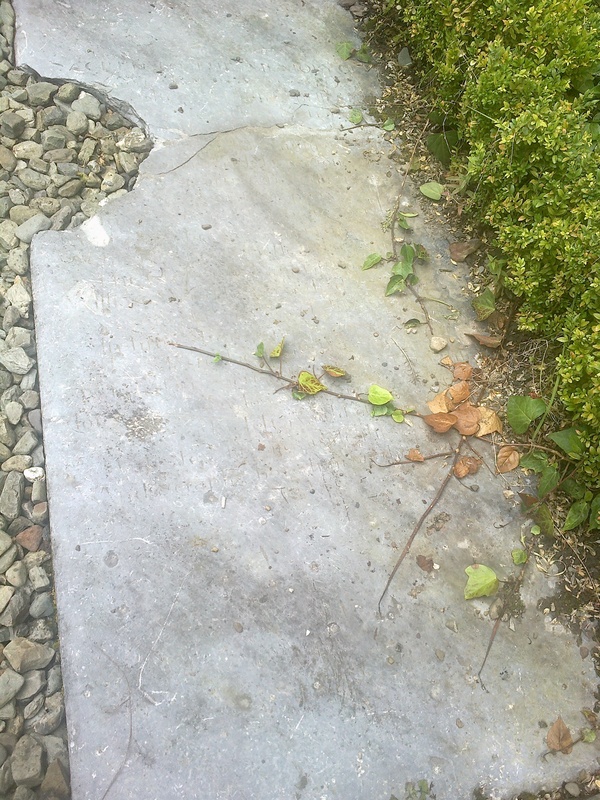 Even then many of the original headstones had been lost. 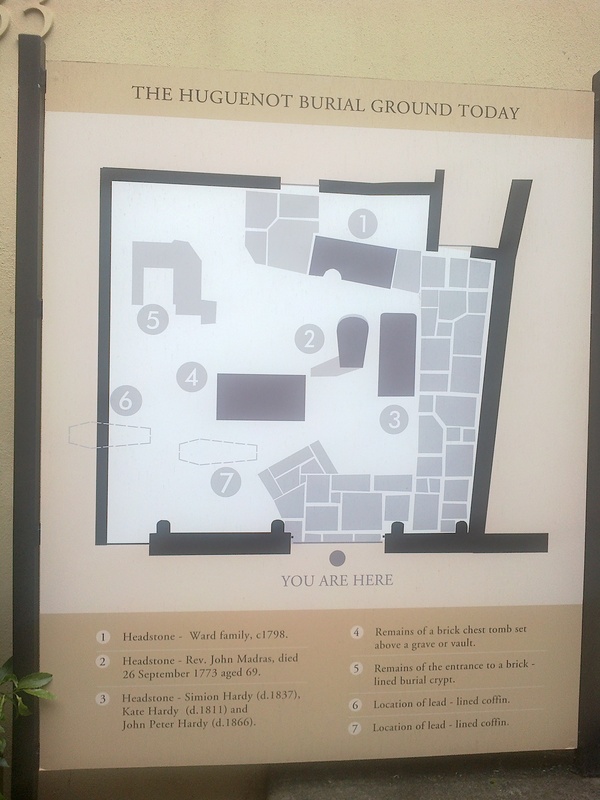 Although the burial ground has been restored it is rarely opened to the public. Being in a busy section of the city I imagine there are fears it could be vandalised. March 17th is known world wide as the celebration of Ireland’s patron Saint, Patrick. People gather in force to emphasise their Irish heritage and to get extremely drunk. Parades are held and pubs are packed. But aside from all the fun, there is the celebration of the legend that surrounds St. Patrick. Almost everyone will be familiar with the basics of the story of St. Patrick. He was born somewhere in Britain of Roman stock and then came to Ireland c.432AD in order to convert the pagan Irish to Christianity. In the process he is also said to have driven the snakes out of Ireland and used the three leaved shamrock as a means of explaining the concept of the Holy Trinity to the pagan Irish. Not surprisingly, the truth is a somewhat more complicated than that. Although Patrick was a real person who embarked on a mission to Ireland sometime in the 5th century, he wasn’t wholly responsible for the emergence of Christianity in Ireland. The first mention we have of Christianity in Ireland is in the chronicle of Prosper of Aquitaine. In his entry for 431, he writes “Palladius was consecrated by Pope Celestine and sent to the Irish believing in Christ, as their first bishop” (Ad Scotum in Christum credentes ordinatur a Papa Celestino Palladius et primus episcopus mittitur) Bishops were somewhat thin on the ground during this period and would only have been sent out if there was a large enough Christian presence to justify it. The Pelagian heresy in Britain was also possibly a reason for Paladius being dispatched to the Irish, as there may have been fears that the Irish Christians could also be ‘contaminated’ by this heresy. Very little is known of the outcome of Palladius ministry in Ireland. Some of the later biographers of Patrick claimed that Palladius had encountered stiff resistance in his ministry in Ireland and had abandoned it, clearing the way for Patrick. However, there are indications in some later Lives of Patrick that the achievements of Palladius may have been absorbed into the later cult of Patrick. 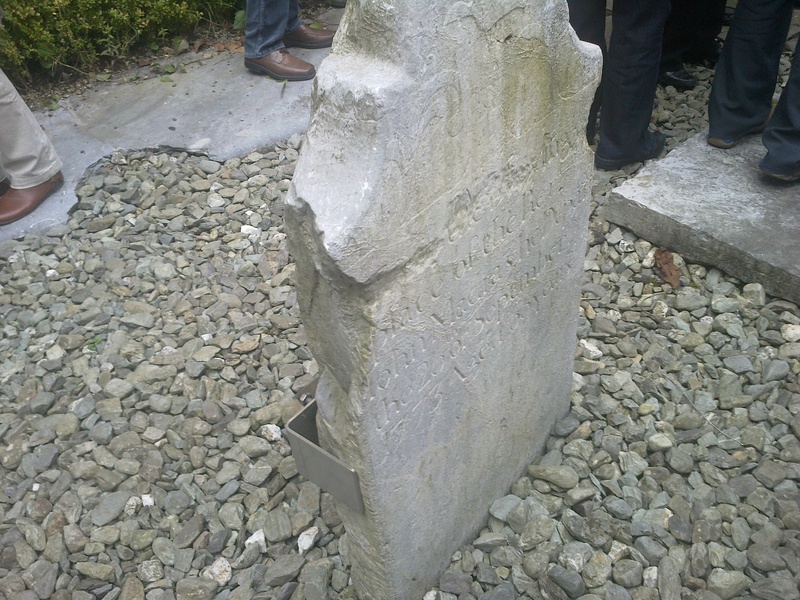 Evidence seems to suggest that Palladius’ ministry was concentrated more in the East of the country, around the Leinster region, where he founded a number of churches. Considering its proximity to Britain it shouldn’t surprise that there may have been a Christian presence in this part of the country. Although Ireland was outside of the Roman Empire it still had strong political and economic links with Britain during this time. If Patrick wasn’t the first to bring Christianity to Ireland then what do we know about him? What little information we can be certain of in relation to Patrick comes from his own writings, two documents of which survive to this day, his Confessio and the Letter to the Soldiers of Corroticus. Patrick opens the Confessio with a brief autobiography, “I am Patrick, a sinner, the most rustic and least of all the faithful, the most contemptible in the eyes of a great many people. My father was Calpornius, a deacon and the son of the presbyter Potitus. He came from the village of Bannaventaberniae where he had a country residence nearby. It was there that I was taken captive. I was almost sixteen at the time and I did not know the true God.” From this opening paragraph, Patrick establishes his identity. He was a Briton and both his father and grandfather had been priests before him. It should be noted that clerical celibacy was not as strongly enforced at this time and some of the lower ranking priests were allowed marry. Patrick doesn’t tell us exactly how long he was in captivity in Ireland for, only that he was with his last master for six years before he found an opportunity to escape. He gained passage on a ship and eventually managed to reach his homeland. Although Patrick puts his escape down to the work of God, it is unlikely he managed it on his own. Chances are that during his time here he built up a number of contacts amongst other Christian slaves and may have used their help in making his escape. From this point on we are told little of what Patrick did before he returned to Ireland, only that he received a letter with the words, ‘The voice of the Irish’, which called to him to return to Ireland. Later tradition has it that Patrick intended to travel to Rome to complete his training but stopped upon reaching Gaul and underwent training there instead. References to Gaul in the Confessio would seem to indicate that he spent at least some time there. During his mission in Ireland he endured captivity once again and numerous threats of violence but still persevered with his preaching. As Patrick tell us, “Let me tell you briefly how the most gracious God often freed me from slavery; how he rescued me twelve times when my life was in danger, as well as from numerous conspiracies and things which I cannot put into words.” He also tells us of the hardships endured by his converts, especially those who became nuns, much to the disapproval of their fathers. Besides dangers from the Pagan Irish he was trying to convert, Patrick also faced dangers from abroad. The Letter to the Soldiers of Corroticus is a condemnation of a raid by a Pictish chieftain who killed and enslaved a number of Patricks converts. Coroticus and his soldiers were nominal Christians and the letter was written for the purposes of excommunicating Coroticus. Patrick also received criticism from the ecclesiastical authorities in Britain who seemed suspicious of his mission to Ireland and his success there. It is believed that the Confessio was addressed to these men and was meant by Patrick as a defence of his mission. The Patrick we see in these writings is a genuinely humble and pious man who believes that he is merely an instrument of God. Patrick goes to great lengths throughout the Confessio to stress his orthodoxy and to make certain that everything that goes on in his mission is above board so that nobody can accuse him of misleading his converts. As far converting the whole of Ireland, Patrick makes no such lofty claims. Many of the later writings on Patrick indicate that his mission was located mainly in the North of the country, which was still predominantly pagan. It is unlikely that he was the only Christian Bishop on the island and there is a good chance that there were Bishops working on converting other parts of Ireland who had their own territories. Patrick may even be seen as part of a concerted British mission to convert the Irish. We can also be sure that it wasn’t until the 6th century with the work of individuals such as St. Colum-Cille (who was responsible for founding many of the great monastic houses such as Iona, Kells, Durrow and Derry) that Christianity began to consolidate its position in Irish society. It was only when the church of Armagh (which had been founded by Patrick) began to claim primacy of all the Irish churches, that claims of Patrick converting all of Ireland began to circulate. Although Patrick may not have been responsible for all that was attributed to him, he still endured much in pursuit of what he saw as a divinely inspired mission to spread Christianity to the farthest edges of the known world. As such, he is certainly deserving of the title, The Apostle of Ireland. It is possible to walk up and down a street everyday and not notice something genuinely odd. For instance the Grand Parade in Cork is one of the busier streets. On any given day I am sure hundreds if not thousands of people must walk along it. But how many people stop to notice the somewhat unexpected feature of a cannon stuck into the ground on Grand Parade at the corner of Tuckey Street. No records survive of why the cannon was placed there or exactly when. It possibly originates from the early 1800s. There are a number of theories as to why the cannon was placed there. In the days when the streets were narrower it may have served as a bollard against cart wheels. 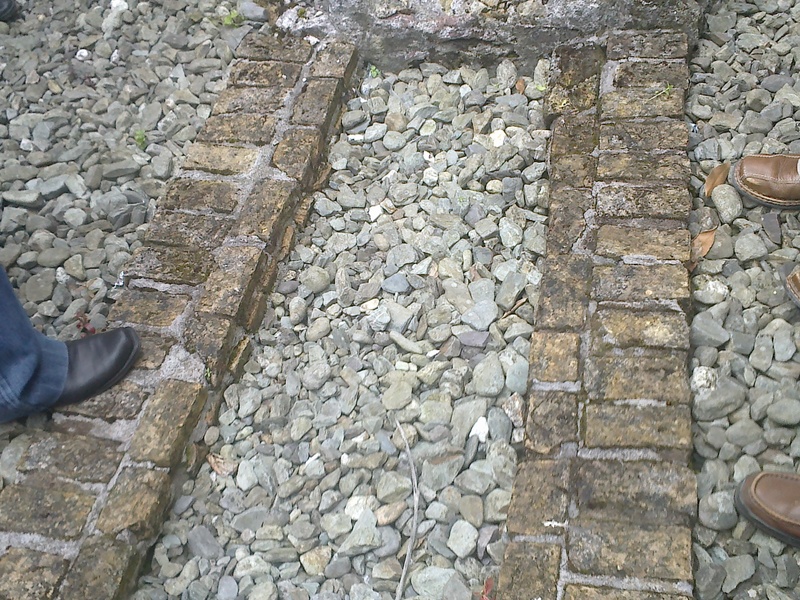 Much of the outer coating of the exposed sides of the cannon had been worn away, perhaps from ship hawsers on the cannon if ships were using it as a mooring post. Although the Grand Parade had once been a water channel it wasn’t a major quay like Patricks Street was before it was filled in. So another theory could be that the cannon was located on one of these quays at somepoint. Or someone might have simply thought it would make a nice piece of street furniture. All three theories could have been true. 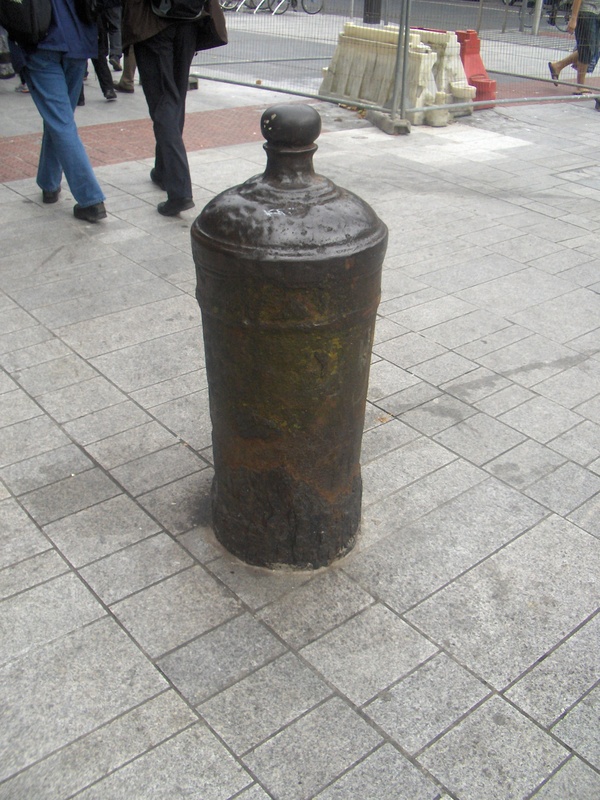 The cannon was excavated during refurbishment of Grand Parade and was wedged firmly into the ground. 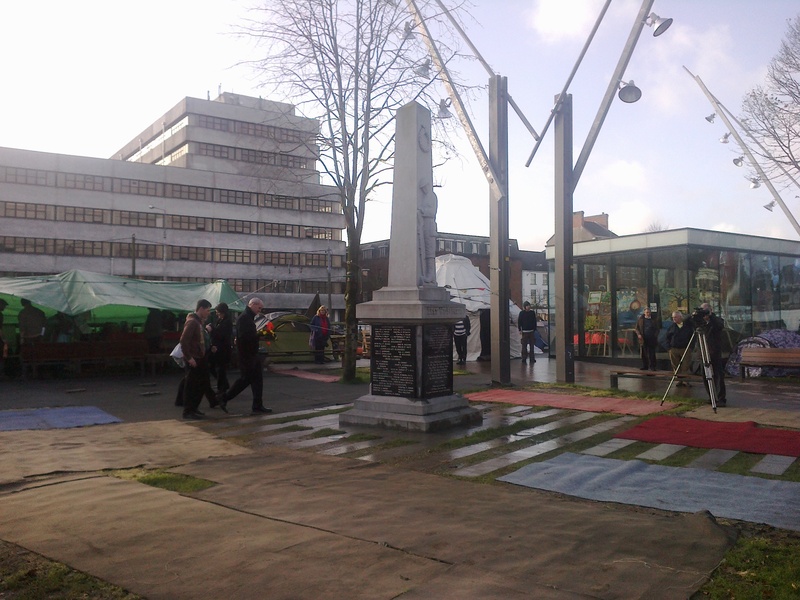 So it was decided to leave it as it was and simply incorporate it into the refurbished street. Although I haven’t written much here in some time and work projects have kept me occupied I have been gathering plenty of interesting images and coming up with ideas for future posts. More to come soon hopefully. Being Remembrance Sunday it seemed appropriate to honour those Irish people who fought in the Great War. As anyone who has studied Irish history knows, for a long time it seemed like these people had been forgotten. This was of course due to the changing political circumstances in Ireland after the 1916 Easter Rising. I guess for a long time the majority of people felt that if we were to honour those who took part in 1916 then we had to ignore those who fought in Europe at the same time. Thankfully the mindset in Ireland is gradually changing and we are no longer confined to such a narrow definition of Irishness. From 1914 to 1918 some 350,000 Irishmen from the island of Ireland and from many parts of the world participated in the Great War that destroyed much of Europe and cost so many lives. Some 50,000 were already active in British regiments. The motivations of Irish servicemen greatly varied; some simply needed the pay, some believed in the nobility of war, while others believed in the cause of standing up for small nations such as Belgium. There was also a political element, some Irish fought in the hopes of gaining Home Rule for Ireland and others fought to maintain the Union between Ireland and Britain. 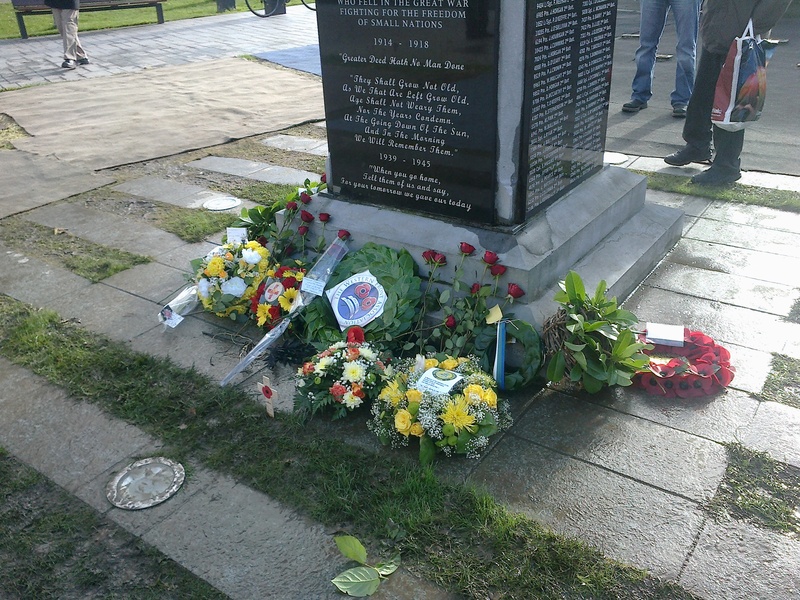 But while reasons for being there may have varied, the common human tragedy of the more than 30,000 lives lost to Ireland should be remembered and better understood. 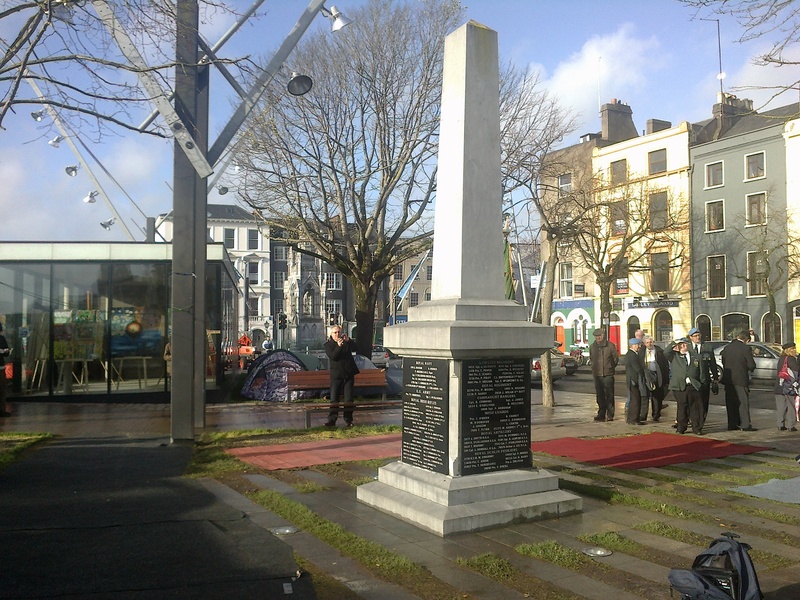 For Armistice Day on Friday I attended a short ceremony at the World War 1 memorial here in Cork. 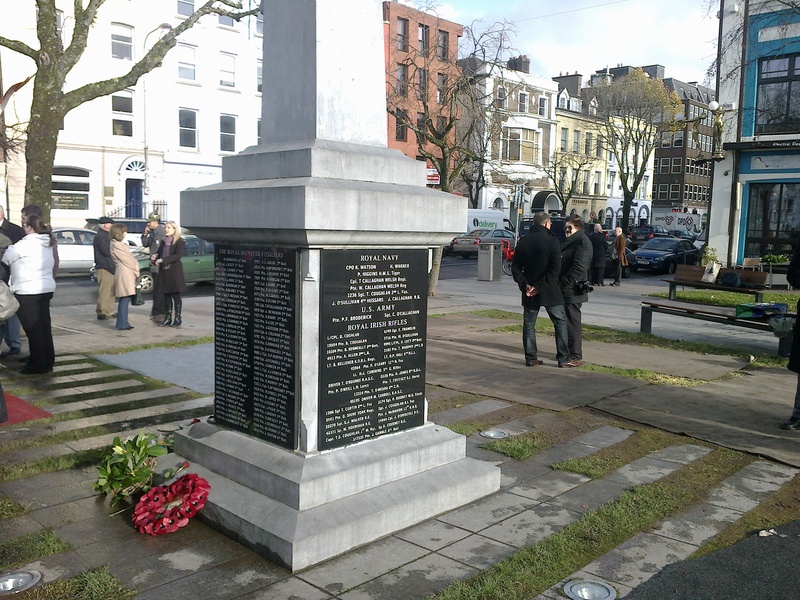 The WW1 memorial in Cork was erected on March 17th 1925. Despite the changed political situation in Ireland there was still a huge attendance. 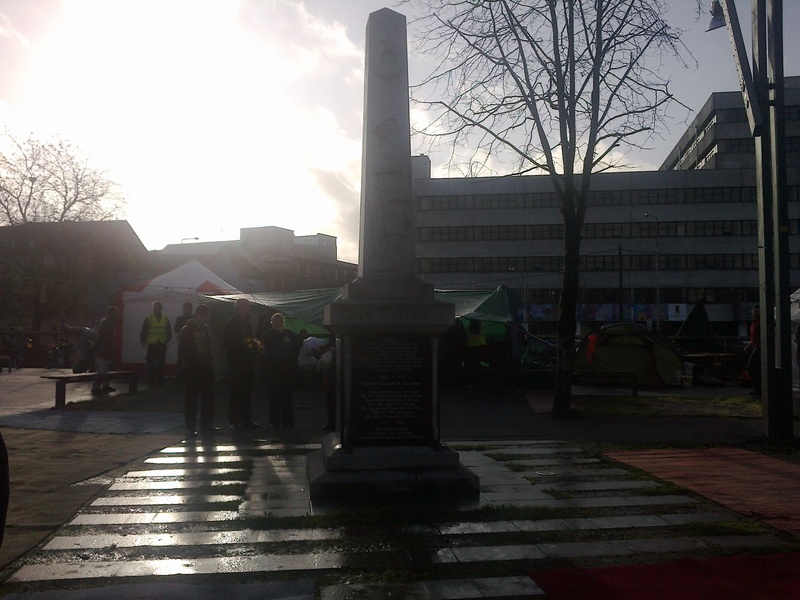 A picture taken at the time shows the South Mall crowded with people. It is one of the few example Irish examples of its type. Carved in relief on a modest limestone obelisk, sitting on a plinth, is the profile of a Munster Fusiliers soldier in full military uniform, head down, gun at rest. The monument was restored in 2008 and the black marbel panels on either side were added. With the centenary of World War 1 approaching, hopefully awareness and understanding will continue to grow in Ireland. Regardless of our politics or how we view war, to forget those who fought would be a grave injustice. For those who want to find out information on their own family involvement in the war, it is worth getting in contact with groups like the Western Front Association who now have a branch in Cork. 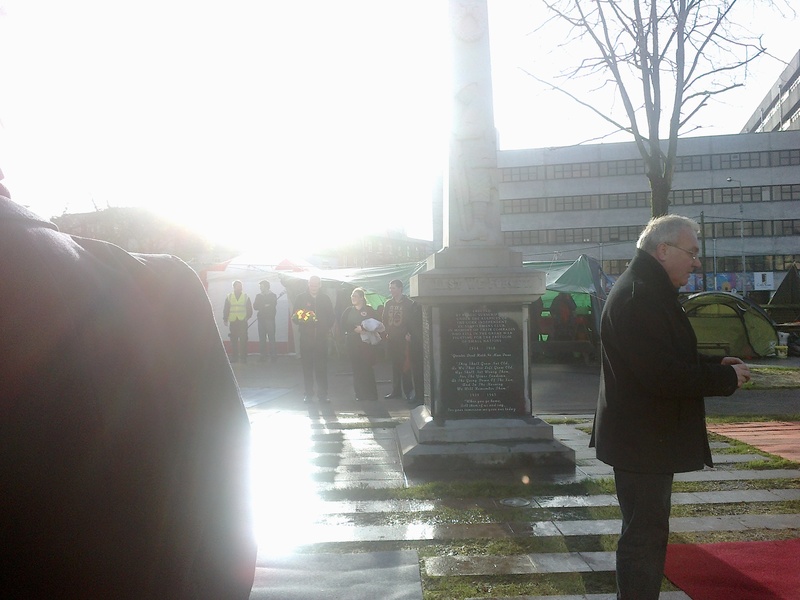 Through their research they have collected a large amount of information on Cork veterans of the Great War.